Finland capitulate on March 12th. Despite the fact, the high command still plans an operation on Narvik… Hitler decide to invade simultaneously Denmark and Norway. In the night from April 8th to 9th, the Germans troops debark with audacity in Oslo, Kristiansand, Arendal, Bergen, Trondheim and Narvik… The Luftwaffe provides a huge air coverage and launches paratroops on Oslo and Stavenger… It’s mobilisation hardly started, the Norvegian army cannot oppose resistance to the German columns who penetrate the country after seizing the large cities and airports. After some hesitations, France and Great Britain decide to send troops to Mamsos and Andalsnes to regain Trondheim… On April 26th, after failing of the operations around Trondheim, the allies decide to concentrate their efforts on Narvik. Meanwhile, the 13th DBLE got the command to join Brest where it embarks after marching in the city’s streets under the population’s applauses… The 13th is now part of the 1st fight-infantry division under command of general Bethouard. On may 4th, after 5 days at sea, the convoy approaches Narvik. The announcement of the success of the German offensive on France started May 10th, incite the Allies to withdraw their troops from this secondary front. They decide to take over Narvik first in order to destroy the harbor and rail installations and also to ease the troops re-embarkation operations. For once, in this campaign, the assailants will benefit from air coverage. From the air base of Bordufoss, more to the north, a squadron of Gladiators and a squadron of Hurricanes will dispute the air supremacy to the German above Narvik and mainly protect the rear base of Harstad from destruction. By 8:00am, the Luftwaffe attacks in force and he German mountain troops benefit to launch a violent counter-attack… The 2nd company must unhook their position. The whole stronghold is now threatened. Lieutenant-Colonel Magrin-Vernerey refuses though to re-embark his troops and send them back to attack. Thank to the resistance of the lieutenant Vendit’s section who did not leave its position conquered on the rail embanking and has forbidden the deployment of the Germans for four hours, the rest of the battalion retake the lost ground. The Norwegian battalion and the 3rd company assault then the German position… Along the railway, canons of 25, uplifted with difficulty to the cliff, neutralize the German strongholds. Due to the many air attack the 2nd battalion kept in reserve for the direct assault on Narvik , cannot be in position till 7:00pm. This late hour incite Lnt-Colonel Magrin-Vernerey to delay the attack to the next day at 4:00am. With the impulse of captain Amilakvari, the 2nd battalion take the initiative to progress and occupy with a weak opposition the hills close to the city evacuated by the German during the night. The sleep of the chief of the 13th DBLE is interrupted by this news: the Legion holds Narvik! 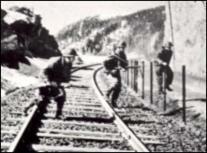 During the following days after the taking of Narvik, the Germans are pushed back to the Swedish border along the railway… But from June 4th to 7th , the 25,000 men of the expeditionary corps are evacuated in high secret, without even informing the Norwegian troops about this decision. The legionnaire of the 1st battalion are the last to leave. To the 13th DBLE, the cost of this campaign is the loss of 7 officers and 60 men killed. Most fell on May 28th in the rank of the 1st battalion… The 13th returns to Brest on June 15th to participate to the Britton redoubt thought by the high command in full decomposition. Moved to Rennes by train, the 13th immediately receive command to return to Brest from where the troops are evacuated to England under the German bombs. A new story starts.